Between 2000 and 2006, there was a consistent flow of over one million Illegal Aliens into America, with one year hitting over 1.6 million. That was just the numbers that were detected and returned across the border. One must understand that similarly, large numbers are going undetected. Reported by the Department of Homeland Security on March 6th, America can see that in February 76,000 illegal aliens were caught at U.S. ports of entry; the Border Patrol has caught 268,000 illegal aliens since the beginning of the fiscal year, a 97% increase above last year’s numbers; apprehensions of Family Units and Unaccompanied Alien Children have increased 338%; just last month, the Customs and Border Protection agents seized the largest illegal shipment of fentanyl ever recorded — more than enough to kill 115 million Americans. With the detention facilities at 283% capacity, some illegal aliens were actually temporarily sheltered under a bridge in El Paso, Texas. And, it has recently also been revealed that 4000 illegal aliens were caught trying to cross in one day, on March 26th, 2019. Even Senator Bernie Sanders (I-Vt), “Big Red” himself, had to reluctantly acknowledge that a crisis exists, but he hedged his words with the usual anti-American tripe, as he suggested that somehow it was the U.S. border policies that were less than humane. Sanders, a 2020 presidential candidate, told ‘Face the Nation’ there is a “terrible humanitarian crisis” at the southern border, as he added, “We need to make sure that our borders are secure, but also we need a humane policy at the border. Secretary Kirstjen Neilsen says eighty percent of asylum seekers pass the first interview, although only 20 percent ever receive asylum. Neilsen further asserts the people refused asylum are “flat-out frauds” or they are here for economic reasons or to be united with family. These are the policies that allowed twice-deported illegal alien Jorge Rios to keep returning to America. Rios, an illegal alien from Honduras, was recently arrested on March 31st for the murder of a New Jersey nanny. And if there’s blame to be placed, place it on Rios and the Democrats, such as Speaker Pelosi and Senator Chuck Schumer who have continuously pushed the Open Borders agenda for political gain, and RINOs, such as Senator Paul Ryan who kept diverting the President from the border emergency to keep the cheap labor pools growing, when the Republicans had the majority and could have done something effective; in some respects, both parties have failed the nation on this issue. Recently, Department of Homeland Security Secretary Kirstjen Neilsen implored Congress “to act ASAP to give DHSGOV the authorities we need to protect children from the terrible journey, discourage illegal immigration, and secure our border”. She added, “Failure to act is putting lives at risk — especially children who are exploited … and … ‘recycled’ by smugglers / bad guys [who] know our outdated laws and [use] children as a ‘free ticket’ into America … without a legal fix and additional resources, there will be no end to the crisis”. This was followed by the President’s orders to halt financial aid to these countries that are not discouraging the hordes of illegal aliens, such as El Salvador, Guatemala, and Honduras. On Saturday, March 30th, the State Department acknowledged that it was moving to withhold approximately $700 billion in aid to the three Northern Triangle Countries. For each complex problem there exists answers that are clear, simple and wrong, such as Democrats insistence that all who arrive at the border be given immediate entry and legal legitimacy too, even to the point of voting in U.S. elections without being a U.S citizen. These red, radical anti-American Democrats, such as Julian Castro, former mayor of San Antonio, Texas and a 2020 presidential candidate, would totally eradicate 8 U.S. Code 1325 if they could, which would decriminalize unlawful entry, failure to depart the country, fleeing immigration checkpoints, marriage fraud, and commercial enterprise fraud. And obstinate as a rock, they refuse to even admit there is an obvious problem, as they turn a blind eye to the endless stream of humanity, the dregs of Central America, trying to force their way into America, even as they wave foreign flags. 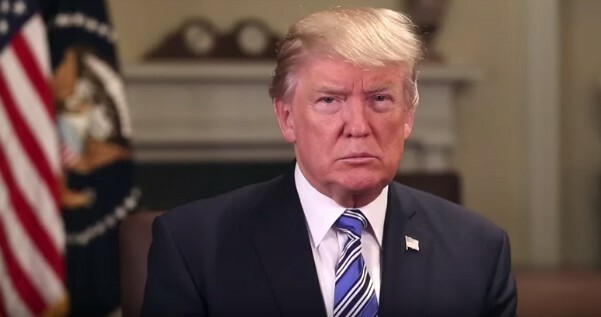 President Trump recognizes the crisis and a problem he says can be fixed by Congress “in 45 minutes”, and his recent actions have put all involved on notice that this problem will be resolved or the problem nations will suffer economically. So too will it bear some economic cost to America, but a little pain now is much preferable to the complete destruction of our nation later. He should absolutely refuse to surrender America’s immigration policies to anti-American Congressmen and foreigners, and he must pursue the complete closure of the southern border if that’s what it takes to force Congress to come to its senses on this issue. Extraordinary circumstances require extraordinary measures, in the name of the security and sovereignty of the United States and humanity.